Last week, I unleashed my (not so) inner feminist in an interview with Christie Aschwanden. Christie is not only a top-notch science writer but also a dear friend. She has written extensively about controversial topics in the breast cancer community. She is on #teamscience, which is not an easy team to play for these days. 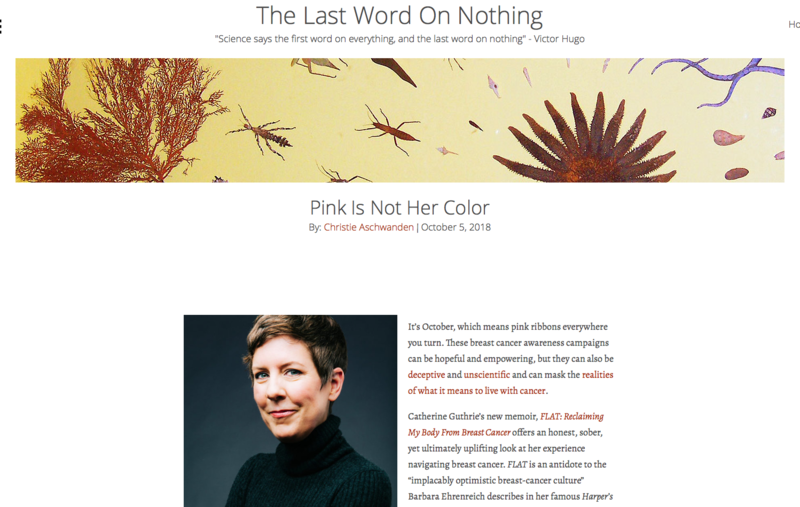 And, so, I deeply appreciate her inviting me to explore some complex ideas I’ve been grappling with these past few months, including how health care providers unintentionally perpetuate systems that harm breast cancer patients . When writing my memoir, FLAT, I aligned closely with the craft of creative nonfiction genre. I worked hard to stay rooted in the roles of character and narrator. Meaning, I didn’t expand my voice or my view beyond the scope of the story and direct connections to the story. So, in some ways, this Q&A with Christie was a welcome exercise as it allowed me to speak in a different register. I got to fully explore some complicated ideas and draw on inspiration I found in Susan Sontag’s essays. I hope you’ll take a look at the Q&A and let me know what you think. Catherine Guthrie is a women’s health writer. 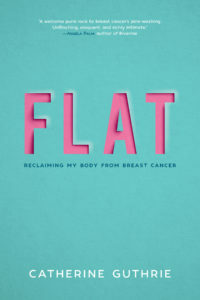 Her memoir, Flat: Reclaiming my body from breast cancer, is due Sept. 25, 2018, from Skyhorse Publishing.